Honey bee, Apis mellifera L., is considered as an essential organism to the agricultural sector due to its role in pollination and alleviation of poverty in rural areas. Many pests attack honey bee colonies causing severe damages and economic losses. These pests include Varroa mites, Vespa hornets, wax moths, small hive beetles, and parasitic flies. Using chemical methods to control these pests causes some negative effects on honey bees and contaminates their products, while using biological control agents is promising and has no serious hazards. This article aimed to review available studies on the role of biological control agents mainly predators, parasitoids, and pathogens in controlling bee’s pests and to present new perspectives. Also, obstacles of using biocontrol agents inside and outside the hives were presented. This article is essential for planning integrated management programs for honey bee pests. Honey bee, Apis mellifera L., occurs worldwide, and it is the main pollinator of many plants (Corbet et al. 1991 and Morse and Calderone 2000). Beekeeping is among the most important agricultural activities thanks to its role in providing many job opportunities at rural areas besides the valuable products of honey bees. These products include, honey, pollen, royal jelly, bee venom, beeswax, and propolis, and have many medicinal uses (e.g., De Castro 2001; Nagai and Inoue 2004 and Eteraf-Oskouei and Najafi 2013). Recently, the loss of honey bee colonies has been recorded in different parts of the world, a phenomenon called colony collapse disorder (CCD) (Maini et al. 2010). The specific reasons behind the CCD are not fully known, but it mostly happens due to a number of harmful factors (van Engelsdorp et al. 2009 and Neumann and Carreck 2010). Unfortunately, many pests such as Varroa mites, wax moths, small hive beetles, Vespa hornets, and parasitic flies attack honey bee colonies causing serious damages (Core et al. 2012; Dietemann et al. 2013; Ellis et al. 2013; Monceau et al. 2014; and Neumann et al. 2016). The use of chemicals to control these pests is not recommended. For example, acaricides and other chemicals that used to control Varroa mites can contaminate bee products (Bogdanov 2006) and can impact negatively the health of honey bees (Abou-Shaara et al. 2017a). On the other side, the Varroa mites can develop resistance to them (Pettis 2004). Also, organic beekeeping practices do not accept the application of chemicals (Lodesani et al. 2008 and Iancu et al. 2012). Searching for safe and sustainable alternatives to control honey bee pests is a very important approach. Also, the use of biological control agents; predators, parasitoids, or pathogens to control the pests can be considered as suitable choices. Biocontrol agents are expected to manage the population of bee pests without causing harmful effects on honey bees and without contaminating valuable bee products. This report aimed to review the available studies on using biocontrol agents, especially predators, parasitoids, and pathogens to control pests of honey bees and to suggest future perspectives. Additionally, the gaps in knowledge and points require detailed investigations are highlighted. There are various mites that can attack honey bees, especially Varroa mites, Varroa destructor Anderson and Trueman (Acari: Varroidae) (Dietemann et al. 2013), and Tropilaelaps mites (Anderson and Roberts 2013), but Varroa mites are more common than Tropilaelaps. These mites feed on the hemolymph of bees, leading to the loss of heavily infested colonies. Also, Varroa mites can host many pathogens, including viruses (Chen et al. 2004) and harmful bacteria (Burritt et al. 2016). The control of Tropilaelaps is easy because these mites infect only immature stages, while the Varroa mites infect both immature and mature stages (Dietemann et al. 2013). Available methods to control Varroa mites include acids, essential oils, acaricides, or mechanical methods, but the efficiency of these methods are not constant or even high and the Varroa can escape them, therefore continues management strategy was suggested (Abou-Shaara 2014). Few biological control agents have been suggested to be used against the Varroa mites (Chandler et al. 2001). Only entomopathogenic fungi and Chelifers (pseudoscorpions) have gained attention and have shown some efficacy in some studies as shown in the next paragraphs. The entomopathogenic fungus Metarhizium anisopliae showed efficacy against Varroa mites under laboratory (Kanga et al. 2002; Shaw et al. 2002; García-Fernández et al. 2008) and field conditions (Gerritsen and Cornelissen 2006; Kanga et al. 2006; Rodríguez et al. 2009; Hamiduzzaman et al. 2012 and Ahmed and Abd-Elhady 2013). On the contrary, field experiments using M. anisopliae against Varroa mites showed negative impact (Gerritsen and Cornelissen 2006 and James et al. 2006). In fact, studies that support the efficacy of M. anisopliae are more than those do not. The reported efficacy ranged 85–100% (Kanga et al. 2002 and Rodríguez et al. 2009). Most of the studies confirmed the efficacy of M. anisopliae within 7–8 days post-treatment (Kanga et al. 2003 and Meikle et al. 2006), without negative impacts on immature (Ahmed and Abd-Elhady 2013) and mature stages of honey bees (Kanga et al. 2002; Kanga et al. 2003; Ahmed and Abd-Elhady 2013), and queens (Kanga et al. 2002). The direct contact between Varroa mites and fungi happened under laboratory conditions but under field conditions various applications methods were used including dusting (Kanga et al. 2003), strips coated with the fungal conidia (Kanga et al. 2006), and placing inoculated mites with spore solutions in beehives (Hamiduzzaman et al. 2012). The appropriate period for application was the period when no or low brood is present in the colonies (Kanga et al. 2006). The second major entomopathogenic fungi, Beauveria bassiana, showed also efficacy against Varroa mites under laboratory (Shaw et al. 2002) and field conditions (Meikle et al. 2008; Hamiduzzaman et al. 2012; Ahmed and Abd-Elhady 2013 and Sewify et al. 2015). These fungi were also isolated from Varroa mites in capped worker brood cells (Steenberg et al. 2010). The death of Varroa infected with fungi usually happened between 5 to 10 days (Meikle et al. 2007). Fortunately, treatments showed no negative impacts on colony health (Meikle et al. 2008), or immature and mature stages of bees (Ahmed and Abd-Elhady 2013). Meikle et al. (2012) recorded high death rates of bees and mites in colonies treated with a commercial biopesticide contained conidia of a strain of B. bassiana isolated from Varroa. Some other entomopathogenic fungi were also tested in few studies and showed efficacy such as Clonostachys rosea under field conditions (Hamiduzzaman et al. 2012), Hirsutella thompsonii under laboratory conditions (Peng et al. 2002) and field conditions (Kanga et al. 2002) without impacting honey bees, while Lecanicillium lecanii showed no efficacy against Varroa (Gerritsen and Cornelissen 2006). The efficacy of M. anisopliae and B. bassiana against Varroa, supported by previous studies, has shown that application methods and suitable periods for applications still need further studies, especially under various environmental conditions. Also, the pathogenicity of other fungi against Varroa mites needs additional investigations. In Europe, Chelifer cancroides is an interesting predatory species for beekeeping. It was firstly observed inside bee colonies in 1891 by Alois Alfonsus (Schiffer 2017). Christophoryová et al. (2012) created a checklist of the pseudoscorpions with 38 species from the Czech Republic and 51 species from Slovakia, formerly Czechoslovakia. In south India, pseudoscorpion Ellingsenius indicus was observed inside bee colonies (Subbiah et al. 1957). Also, pseudoscorpions were observed in New Zealand (Fagan et al. 2012), Cameroon (Fombong et al. 2016), and in some Arabian countries including Egypt (personal observations). Fagan et al. (2012) reported that 25 pseudoscorpions were sufficient to manage the population of Varroa within hives. Mass-rearing methods for two pseudoscorpions (Nesochernes gracilis and Heterochernes novaezealandiae) were developed in New Zealand, and N. gracilis showed the most promising role for biological control of Varroa (Read et al. 2014). Also, a molecular technique based on detection of Varroa DNA in extractions of pseudoscorpion DNA was developed to confirm the predation in commercial hives without the need for observation (van Toor et al. 2015). Rangel and Ward (2018) evaluated the ability of the predatory mite Stratiolaelaps scimitus (Mesostigmata: Laelapidae) to control Varroa under laboratory and field conditions. In vials, 97.10% of the exposed Varroa to the predatory mites died after 24 h, while only 6.85% died in the control group. Under field conditions, S. scimitus showed insignificant impact on Varroa. This study gave some hope to utilize S. scimitus as a potential biological control agent to Varroa. In fact, few studies have been conducted on the predators of Varroa, especially under hive conditions. It seems that using entomopathogenic fungi is more effective and practical than predators. There are two species of wax moths, the greater wax moths (GWM), Galleria mellonella L., and the lesser wax moths (LWM), Achoria grisella F. (Lepidoptera: Pyralididae). These moths attack wax combs to feed on cast larval skins and stored food. They can destroy wax combs either inside or outside the hives (Ellis et al. 2013; Kwadha et al. 2017). Wax moths invade weak colonies; hence, such colonies can be completely destroyed by their larvae. There are different mechanical and chemical methods to control wax moths, outside the hives (Ellis et al. 2013), but inside the hives, the control options are very limited and mainly depend on boosting the strength of colonies, or using specific traps (Abou-Shaara 2017a). The biology of these moths has been well studied, and they can complete their development on different types of food (Coskun et al. 2006) and on paper wasp nests (Abou-Shaara 2017b). These wax moths are used in some beneficial aspects like mass rearing of the egg parasitoid Trichogramma species (Boldt and Marston 1974) and to get rid of plastic wastes (Bombelli et al. 2017). There are a few studies on using microbial agents to control the wax moths. The common microbial agent, is the entomopathogenic bacteria, Bacillus thuringiensis (Bt) (Burges 1978) that applies on empty combs. Bt produces a variety of stomach toxins to larvae. Presently, there are some commercial formulations of Bt available for controlling wax moths in stored combs. But the efficacy of Bt is not persistence (Kwadha et al. 2017). Benzina et al. (2017) isolated 9 Bacillus strains from GWM larvae, and the strain S4 caused a mortality rate of (50–83.3%) to GWM after 3 days. Hanley et al. (2003) studied the possibility of using transgenic Bt corn pollen to control wax moth larvae without negative impacts on honey bees in laboratory trials. More studies are still required to assess the efficacy of Bt against GWM and LWM larvae under store and hive conditions considering any negative impacts on honey bees. Other pathogens like alimentary tract parasites, neoaplectanid nematode DD-136, to GWM (Poinar Jr and Himsworth 1967) and entomopathogenic fungi (Serebrov et al. 2006) were studied in regard to their impacts on physiology of wax moths and were not utilized as biological control agents. The parasitoids, especially Bracon hebetor (Say.) and Apanteles galleriae (Wilkinson) (Hymenoptera: Braconidae), are potential biocontrol agents to wax moths (Kwadha et al. 2017). A. galleriae causes disturbance in development and alterations in the endocrine system of GWM larvae (Wanl et al. 1994), while the venom of B. hebetor showed negative effects on GWM reducing oxygen consumption of larvae (Waller 1965), meanwhile GWM can be used for mass rearing of B. hebetor (Alam et al. 2015). In fact, these two parasitoids attack wax moth larvae in stored combs outside hives or inside empty hives. Personal observations confirm the ability of these parasitoids to attack wax moths only on combs without adult bees and not inside the crowded hives. It seems that the parasitoids cannot be used under hive conditions because bees prevent them from access to inside hives. Also, wax moth larvae usually occur within wax combs and cannot be easily detected by the parasitoids inside crowded hives. Thus, Bt and parasitoids are suitable under store conditions, while only Bt can be used under hive conditions. The small hives beetle (SHB) Aethina tumida Murray (Coleoptera: Nitidulidae) was recorded in some countries including the UK, USA, Italy, Sudan, and Korea (El-Niweiri et al. 2008; Palmeri et al. 2015 and Neumann et al. 2016), but not in Egypt (Hassan and Neumann 2008 and Abou-Shaara et al. 2018). SHB invades honey bee colonies and its larvae feed on stored food and wax causing damages to combs. The larvae pupate in the soil (Frake and Tubbs 2009). Various methods are available to control the pest such as baits (Arbogast et al. 2007) and irradiation (Downey et al. 2015). Entomopathogenic fungi (Muerrle et al. 2006) and entomopathogenic nematodes (Ellis et al. 2010) are major biological control agents found attacking the SHB (Cuthbertson et al. 2012). Besides, there are some minor agents including Aspergillus niger and A. flavus (Richards et al. 2005), the storage mite Caloglyphus hughesi (Strauss et al. 2010), the ant Pheidole megacephala, as a predator of larvae (Torto et al. 2010), and a protozoan pathogen (Wright and Steinkraus 2013) have been reported. Mortality of SHB increased when B. bassiana and M. anisopliae variety anisopliae were used, using spore suspension bioassays. Hirsutella illustris and M. anisopliae showed no impact (Muerrle et al. 2006). SHB larvae were susceptible to entomopathogenic nematodes Heterorhabditis megidis, Steinernema carpocapsae, and S. riobrave with (95%) fiducial limits of 120–231, 124–262, and 150–504, and LC50 of 157, 164, and 204 infective juveniles/insect larvae, respectively (Cabanillas and Elzen 2006). In another study, the two nematode species; S. riobrave and Heterorhabditis indica showed potential to control SHB for 19 weeks with 76–94% mortality after a single soil inoculation and 88 to 100% mortality rate in the field bioassay (Ellis et al. 2010). Also, H. indica showed efficacy against SHB, using the tape-formulation approach under laboratory conditions (Shapiro-Ilan et al. 2010). Moreover, high virulance was found by Steinernema kraussei and S. carpocapsae to control SHB causing 100% mortality of larvae, and the efficacy extended for 3 weeks in soil (Cuthbertson et al. 2012). Entomopathogenic fungi and nematodes are promising bioagents to control SHB but more studies are required, especially under field conditions considering different soil types. Also, the appropriate application methods of these biological agents need to be determined to ensure the sustainability of these agents. Different species of Vespa hornets (Hymenoptera: Vespidae) attack honey bees and may invade the colonies and destroy them. These hornets feed on immature and mature bees, virgin and mated queens, and stored food inside the colonies. The species belong to genus Vespa that occur at various countries (Archer 1998). Typically, Vespa orientalis Linnaeus, 1771 attacks honey bees at the Middle East, North Africa, and South Europe, while other species occur in Asian countries. The Asian hornets, Vespa velutina Lepeletier, 1836 has been recently considered as an invasive pest to Europe (Monceau et al. 2014 and Turchi and Derijard 2018). Traps with different type of baits are used to manage the hornets (but the efficiency of these traps is impacted by various factors and is not sustainable (Demichelis et al. 2014). There are various pathogens to Vespa hornets but they are temporarily used to infect hornet nests (Rose et al. 1999). To a certain extent, the nematodes (Pheromermis spp.) were predicted to have negative impacts on the social wasps (Vespinae) and produced sexuals (Martin 2004). Their use may be helpful to manage the nests of harmful hornets. Few parasitic nematodes mermithids (Pheromermis spp.) were recorded in France without expectation of being suitable as biological control agents (Villemant et al. 2015). Entomopathogenic fungi, isolated from France and applied as direct inoculation method, walking on a contaminated surface, in the food, or by inter-individual transfers showed efficacy against V. velutina (Poidatz et al. 2018). 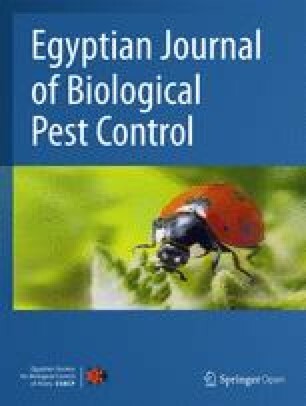 Generally, utilizing pathogens to control Vespa has not been supported by previous studies, and this may be explained by the social nature of Vespa hornets. However, isolating of pathogens from nests and developing application methods are still required to manage hornets beside other control means. The parasitoid species, Sphecophaga vesparum Curtis (Hymenoptera: Ichneumonidae), was found attacking up to 100% of V. orientalis nests, causing a reduction in production of queen cells (Donovan 1991 and Havron and Margalith 1995). It was recorded in northern Jordan as a natural enemy of Vespa orientalis (Haddad et al. 2005). In New Zealand, Beggs et al. (2008) recorded 17% parasitization with S. vesparum vesparum, and the high parasitoid density showed no noticeable effect on the host nest, suggesting less suitability as biological control agent. As well, the indigenous parasitoids, Conopid flies in France, showed no suitability to serve as biological control agent (Villemant et al. 2015). The parasitoid, Sphecophaga can be considered as a promising parasitoid to control hornets. Additional investigations to develop the methods of its mass rearing and to enhance its efficacy are needed. One of the new threats to honey bees is the parasitic fly, Apocephalus borealis Brues (Diptera: Phoridae), which recorded in some countries including the USA (Core et al. 2012), and Saudi Arabia (Mohammed 2018). This fly attacks the bees outside hives, and its parasitic larvae destroy the body of infected bees. The infected bees have some abnormal movements and crawl on the ground (Core et al. 2012). The fly control options are very limited and need intensive research studies. Also, the fly species Megaselia rufipes and M. scalaris (Diptera: Phoridae) were recorded as facultative parasitoids to honey bees in Italy (Ricchiuti et al. 2016). M. scalaris was recorded also in Cameroon (Cham et al. 2018). The biocontrol agents of these parasitic flies are not yet available. Temperature at brood nest ranges from 33 to 36 °C and is actively regulated by bees utilizing different methods (Abou-Shaara et al. 2017b). This temperature range represents a challenge to the role of biocontrol agents that can be used inside the hives to control Varroa mites, wax moths, or small hive beetles. Therefore, screening the survival ability of the selected biocontrol agents to hive microclimate is a necessary step to determine the appropriate control agents. For example, temperature is very important factor for the efficacy of entomopathogenic fungi (Davidson et al. 2003), but few isolates of M. anisopliae and B. bassiana could tolerate the 35 °C (Rodríguez et al. 2009). Another problem is the behavior of honey bees against used agents inside the hives, especially parasitoids and predators, as the honey bees may attack these agents and suppress their efficacy. On the other side, the used agents inside hives may infect honey bees or cause passive impacts on colony performance, especially egg laying by queens or brood rearing. Therefore, field trails are very essential to assess the reactions of bees against utilized agents and to ensure the absence of any negative impacts on immature and mature stages of bees. Additionally, the overlapping between beekeeping practices including regular inspections of hives, artificial feeding, transportation of hives, or using chemicals inside hives and biocontrol agents should be taken into account and properly and regularly evaluated. Ecological factors, especially the air temperature, life cycle of the target pests, and timing of using microbial agents or parasitoids should be considered during the applications of biocontrol agents to ensure the efficacy of the agents. Moreover, environmental contamination with pesticides or other pollutants should not be neglected because such pollutants can negatively impact the efficacy of the used agents. Additionally, the indirect impacts of used biocontrol agents against non-target organisms other than bees should be taken into consideration. Predators, parasitoids, and/or microbial biopesticides are available to pests of honey bees, except the parasitic flies. In general, these biocontrol agents cannot be used alone to control the pests of honey bees, but they should be implemented in well planned integrated pest management programs. Searching for more specific and effective biocontrol agents is very essential, especially under future climate change challenges, which can greatly impact honey bees (Le Conte and Navajas 2008). Geographical information system (GIS) has been recently used in beekeeping for many purposes (e.g., Estoque and Murayama 2010 and Abou-Shaara et al. 2013). This system can be also used to map and evaluate the efficacy of biocontrol agents applied outside hives. The geographical locations of suitable local predators or parasitoids can be mapped and analyzed, using GIS to better understand the habitat of these agents and hence suitable environmental conditions for utilizing these agents can be identified. Implementing GIS with biological control strategies can be considered as a good perspective to detect new biocontrol agents and to evaluate their efficacy. Also, searching for suitable and cost-effective methods to rear parasitoids and predators of honey bee pests is very essential and should be continually developed. Moreover, the application methods of microbial biopesticides need more development to ensure the sustainable release of these microbes and hence long term efficacy. All references that support the study are included in the manuscript. HA-S designed the study. HA-S and MS wrote and revised the manuscript. All authors read and approved the final manuscript.